Women are always looking for ways of makng their hairstyles more interesting, more appealing and as gorgeous as possible. Fortunately, there is an area that requires your attention and that will surely bring you the recognition that you desire. 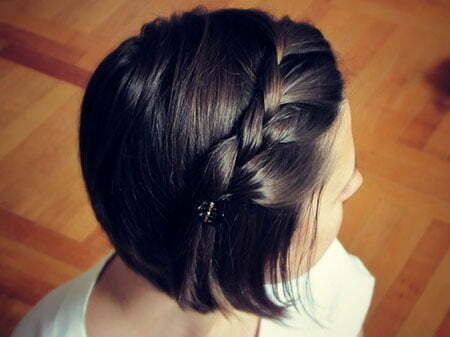 If you want to be admired, then why don’t you opt for hairstyles that include a braid? After all, since you wre young, your mother surely has braided your hair at least a few times. It is simple and it has a really nice effect. Especially if you are going for something a bit more original, then opting for curls or straight hair should not be the only choice that you make. You can add a braided strand of hair and call it a success. The truth is that you need to know how to make a braid look fabulous. Fortunately, you do not have to look too far for ideas as you just need to browse through these pics of great braids! When you have longer bangs, you have option of leaving your hair wavy or straight as it is and then just take a trand of your bangs and braid it. The effect will be fantastic if you just take a minute and braid your hair! Actually, the entire look is a combination between braided hair and a bun that completes the look. It is not that hard to achieve, but it might be a bit challenging if you try to do it without any help. It looks great! If you have straight hair and you want a rather interesting look, then you have the option of braiding your hair and then put it up by using some pins and alowing the strands of your hair to look as spikes. When you have really short hair, you do not have that many options of braiding your hair. Nevertheless, you can opt for a simple braid that will have an interesting effect and that will only require you to braid your bangs. As long as you braid your hair sideways and then you pull them up in the back together, you might be on to something. If you add some great hair accessories, you will surely be looking at a fantastic hairdo. The interesting thing about this hairstyle is the fact that you do not have to actually have a crown to look like a queen. Instead, you could easily braid your hair to look like one and you are winning both a crown and a great look! 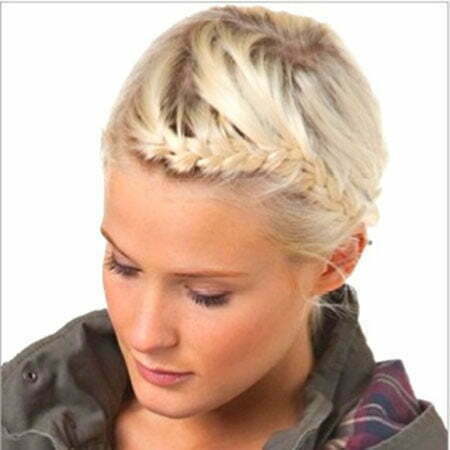 Eve though you do not see this type of braid very often, you can opt for it due to the fact that it is different from the regular braid. You just need two strands and the effect will be truly fantastic. Just try it! Even though you might think that you need really long hair for this hairstyle, you should know that you actually don’t. Braiding your hair will surely make it look longer than it actually is and it will look beautiful! 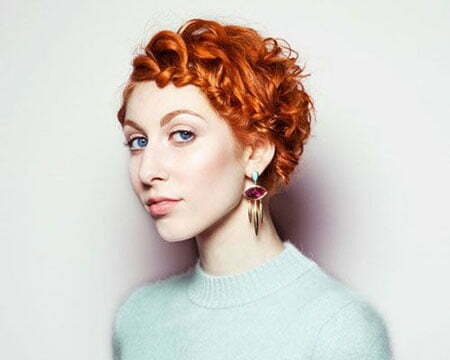 One of the things that you should know about red hair is the fact that it is extremelly attractive and that any hairstyle would look great. So, if you opt for a braid and a bun, you will make it look even more attractive. If before we were talking about a braided crown, now we add a new element – spikes. Is is truly and interesting look that you should try, especially if you want to have a more original hairstyles that is not that simple. This is surely a type of braided hairstyle that should be chosen by women that have really short hair. Regardless of the length of your hair, you can still opt for an interesting braid that will make you look gorgeous! As you can see in the picture, the hair is braided on both sides, but the braids do not actually meet in the middle, fact that makes this hairstyle more than interesting. It is certainly not something that you see every day. Now, if you only thought that you would see a messy braid if you slept with your hair like that, then you should take a look at this picture. The braid is styled to look a bit messy, but the effect is truly fantastic! If you have really short bangs that does not want to stay in one place, then you can simply tame it by opting for a small braid. It will look chic and the entire look will be saved. 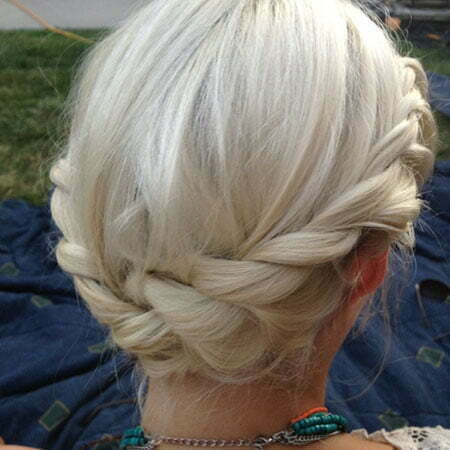 Look gorgeous with a small braid! Now, even though you would just have one side of your hair braided, the good news is that you will look fantastic. Of course, you can make your job easier, by opting for a strand of artificial hair. So, start braiding!